Extremely LOUD and Wicked Monster School Bus Is Showing Off! Undisputedly, cars and trucks are toys that no man can resist. No matter the age, no matter the type of car. However, monster trucks belong to a completely new category. Of course, they are irresistible as well! Also, they come with various bodies and one pretty popular body type is the school bus! It`s like a dream come true! We would give anything in order to ride in a monster school bus! In addition, a monster truck like this will always remind you of the time when you were supposed to go to school. Watch this smashing vehicle roaring the engine, jumping all over the place and doing donuts! Furthermore, we would like to give you a piece of advice at this point. The monster truck you are about to see is really loud. So, we often suggest to increase the volume of your sound devices, but this time we would feel guilty if we suggest that. Anyway, do not try to hide your desire to go back to school with this monster school bus. That would be amazing, don`t you think? 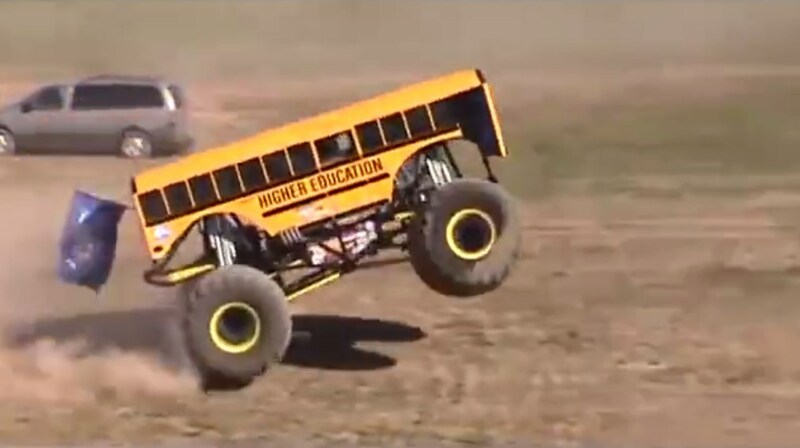 Finally, click here to watch another unbelievable school bus in action. This one is from Puerto Rico and is extremely fast! !